Shanghai Clinical Research Center Phase I Clinical Research Unit (SCRC-PCRU) is one of the leading organizations involved in phase I clinical trials in China. SCRC-PCRU was previously known as Xuhui Central Hospital Phase I Clinical Research Unit. It has a long history of working with the pharmaceutical industry to offer special expertise in conducting early phase clinical studies under SFDA and FDA IND applications for innovative products. Since 1999, the unit has been engaged in numerous phase I clinical trials, bioequivalence studies and clinical pharmacology studies. The unit operates in accordance with ICH-GCP and Chinese GCP. All staff at SCRC-PCRU are GCP trained, and its investigators are certified by Association of Clinical Research Professionals (ACRP), USA. 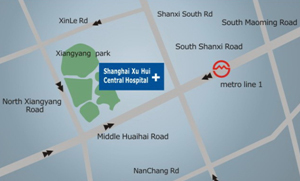 SCRC-PCRU, a 56-bed unit is located within the confines of Xuhui Central Hospital. The hospital provides a newly renovated extension at Level 20, Block 1 with a floor area of 1,000 square meters. This is in addition to the original 1500-square-meter space, at Level 14, Block 2, that is devoted to conducting Phase I studies, ensuring the highest quality medical care and safety standards. This facility was developed in consultation with some of the top R&D centers of pharmaceutical companies in China. A 12-bed intensive observation unit (IOU), Emergency Room, EMG room, ECG Room, Blood Drawing Room, Laboratory Room, Drug Storage Room and Entertainment Area etc. In compliance with CAP and ISO15189, the Central Laboratory offers comprehensive and flexible laboratory services, including drug pharmacokinectics, pharmacogenomics, clinical laboratory testing services, drug evaluation services, laboratory technology validation services and biomarker studies. With a floor area of 1500 square meters, the Central Lab is accommodated with the state-of-the-art technologies and equipment, including GC/MS, Flow Cytometry, MassARRAY, LC/MS/MS, Luminex, ICP/MS, etc. It can provide LC/MS analysis service on drug and metabolics in biological samples by following FDA-GLP compliance. http://www.scrcnet.org/PCRU_en.asp How Do I Get There?